Public stone bath in main building and private baths in second building. Beautiful wooden furniture. Crab served year round. 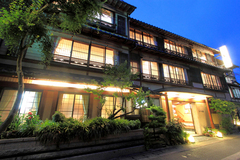 The outer facade is constructed in the beautiful and traditional Japanese fashion, a lattice of natural wood and white walls, which compliments the ambience of the town. The wooden interior warmly welcomes our guests as they enter. From the wooden lounge and cozy interior rock garden one's gaze wonders out upon the impressive view of tiled roofs and eaves, wooden rails and Japanese paper windows. Part of the glass floored corridor travels over a small pond with colorful carp swimming. Let your mind wander as you watch the carp carelessly swim about. We like to take pride in our crab cuisine that is served year round. All of our seafood is caught fresh in the local harbor, among the catch is red snow crab and snow crab. We use only naturally (organic) grown produce, locally grown. This allows us to create naturally delicious tasting cuisines for our guests. 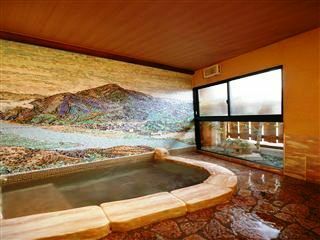 Our large public bath is made from boulders found from all over Japan. Relax in the gentle warm waters and rustic style. 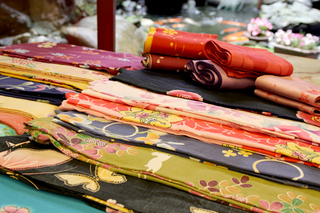 Free designer yukata(cotton kimono) rentals. Women can choose from several colorful variations to wear around town to visit the outdoor public hot springs. 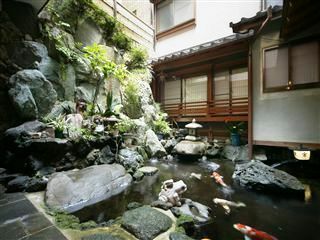 The small pond arranged with stones gives the feel of an indoor garden. Part of the corridors floor being glass sticks over the pond, letting you watch the colorful carp swim bellow. Private bath with jacuzzi. The bath is accented with a beautiful tiled mural. The bath can be reserved for free for up to 40min, ask at the second building. Digital LCD T.V., AC unit, refrigerator, safe box, restroom with bidet and washrooms found in all rooms. Can accommodate up to 100. Some rooms have heated tables and garden views. 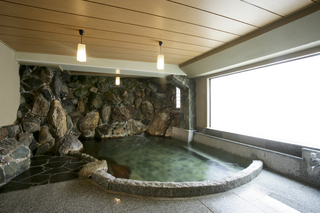 Our large public bath is made from boulders found from all over Japan. Lose yourself in the gentle waters of the hot bath. There is a second smaller, rustic stone bath too. The baths are open from 6am and are gender segregated. The designated bath genders change periodically so that our guests get a chance to enjoy both. Guests can enjoy a leisurely round of gateball(like croquet) while staying with us. A large banquet hall (approx size 119m^2) that can fit up to 100 people. The room can be partitioned off for smaller groups. The banquet hall also comes equipped with a karaoke system. The perfect place to enjoy your next banquet.